The neuronal network is a computing system that transforms input to output. This computation involves complex nonlinear processes through polysynaptic feedforward and feedback microcircuitry, and thus cannot be addressed either with isolated neuron responses or averaged multineuronal responses. Functional multineuron calcium imaging (fMCI) is promising to solve this problem. The fMCI is a large-scale recording technique that simultaneously monitors the firing activity of more than a thousand neurons through their somatic Ca2+ signals. Because of several advantages, including i) simultaneous recording from numerous neurons, ii) single-cell resolution, iii) identifiable location of recorded neurons, and iv) detection of non-active neurons during the observation period, fMCI attracts attention as a new-generation large-scale recording method. 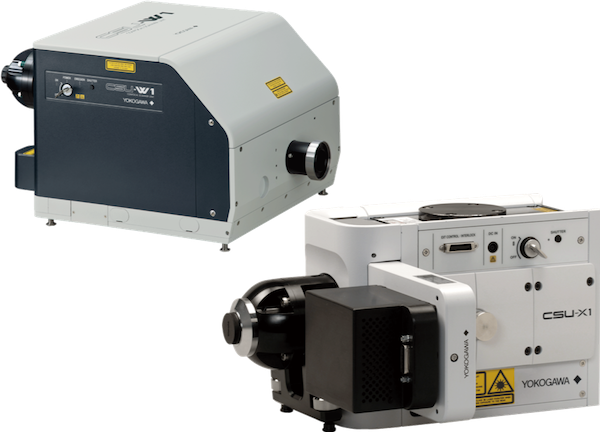 In vitro fMCI is made more sophisticated by using multipoint ilumination and scanning with the CSU in combination with low-intensity lasers and an EM-CCD (electron-multiplying charge-coupled device) camera. This CSU system allows to achieve ultra-high-speed and high-resolution fMCI in hippocampal slices; the Ca2+ fluorescent intensity of a large number of neurons can be monitored at the speed of up to 2,000 frames per second. This is one of the applications that make best use of the high-speed performance of the CSU Confocal Scanner Unit. Data: Yuji Ikegaya, PhD, Associate Professor at University of Tokyo Graduate School of Pharmaceutical Sciences. The CSU-X1 is widely recognized as the leading tool for live cell imaging with 2,000 fps capability.